When summer rolls around, I basically just lose all control when it comes to grocery shopping. 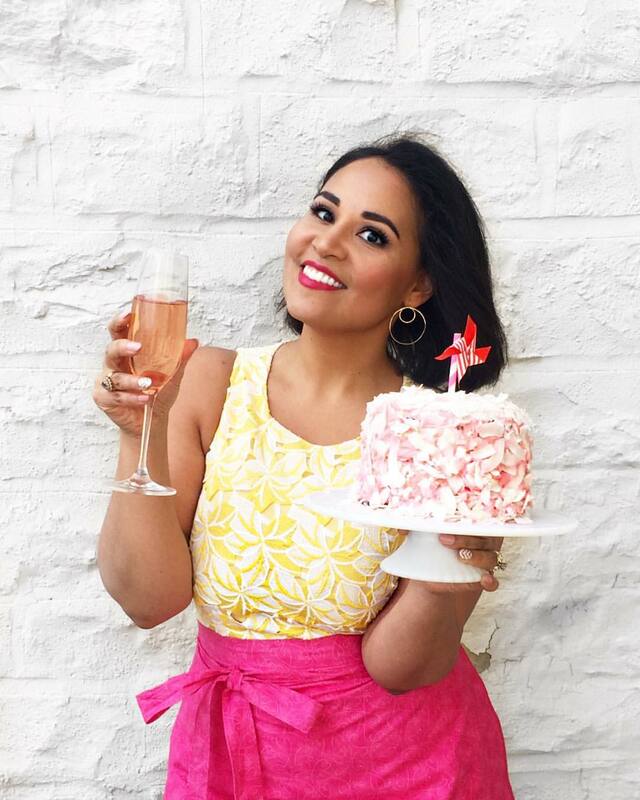 Lately it's the strawberries that are seducing me, and I've been buying pound and pounds of them, filling up the fridge and using them in all things sweet and savory. Over the next few months, I've teamed up with one of my favorite brands ever ever--Tabasco--to create a series of recipes featuring their range of sauces. I'm starting up with Tabasco Chipotle--a smokey, sweet, and absolutely wonderful hot sauce that I love to put on basically everything. Until now, I've only used it in savory recipes, but with a fridge full of these gorgeous berries, I decided to use them in a dessert. And oh wow, is it good! I know it might sound a little unusual, but I promise that it's just good. 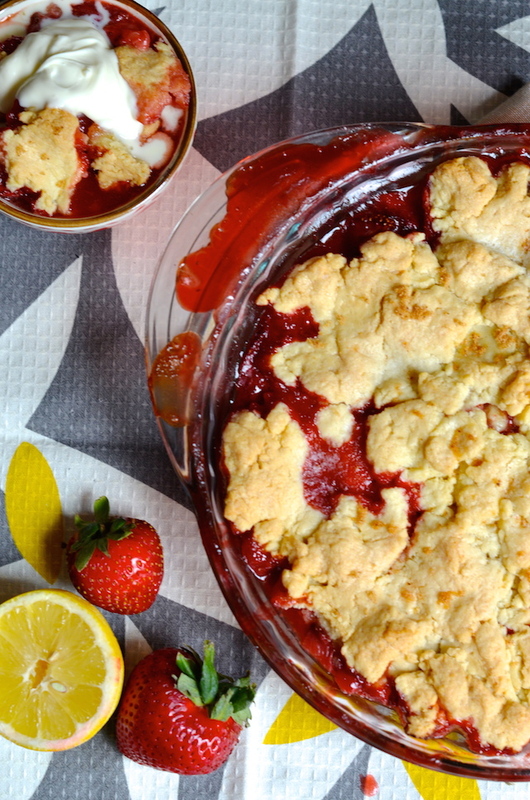 The smoky heat pairs beautifully with the sweet berries and tart lemon. Under a sweet and buttery crust with just a hint of salt, it's a stunning (and ridiculously easy!) dessert that will satisfy all your cravings at once. This is one of those recipes that comes together so quickly, too. I toss the filling together right in the baking dish, and then make the crust in a food processor (a bowl + pastry cutter or fingertips works, too!). It bakes for just a little over half an hour, and it's ready to go. Serve it up hot right out of the oven, or let it sit and cool off first. Either way, a scoop of something creamy on top is a must. I love tangy creme fraiche or sour cream (it's especially good with the tiny bit of spice! ), but ice cream or regular whipped cream would be amazing, too. If you love sweets with a hint of spice, you'll die for this. Trust me on it. Disclosure: This post was sponsored by Tabasco. Over the next few months, I will be sharing a series of recipes inspired by some of my favorite Tabasco sauces. All recipes and opinions are strictly my own. Thank you for supporting great brands like Tabasco that make it possible for me to create new content for you. Loved this post? I'd love if you'd share it with your friends on Pinterest or Facebook! And let's connect so you can find out the next time I post! Follow me on Twitter, Instagram, or Pinterest, become a fan on Facebook, or sign up to receive my once-a-week e-mail updates. Preheat oven to 350 degrees. Butter a deep 9” pie plate. 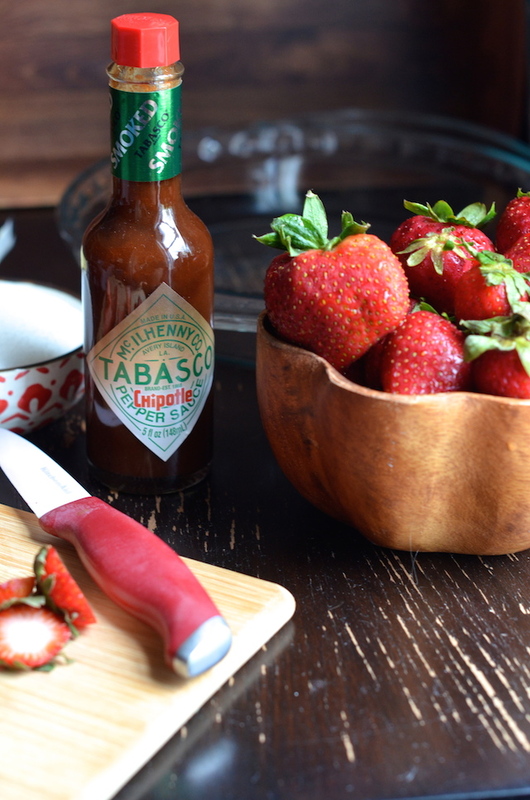 Toss the strawberries with the sugar, Tabasco Chipotle, lemon zest, vanilla extract and corn starch. Place in the pie plate (I mix it up right in the pie plate). Whisk together flour, sugar, baking powder, and salt. Using a pastry cutter or food processor, cut in the butter until crumbly. Add the egg and milk, and pulse or mix a few times just until it comes together into a dough. Spread chunks of the dough over the strawberries. 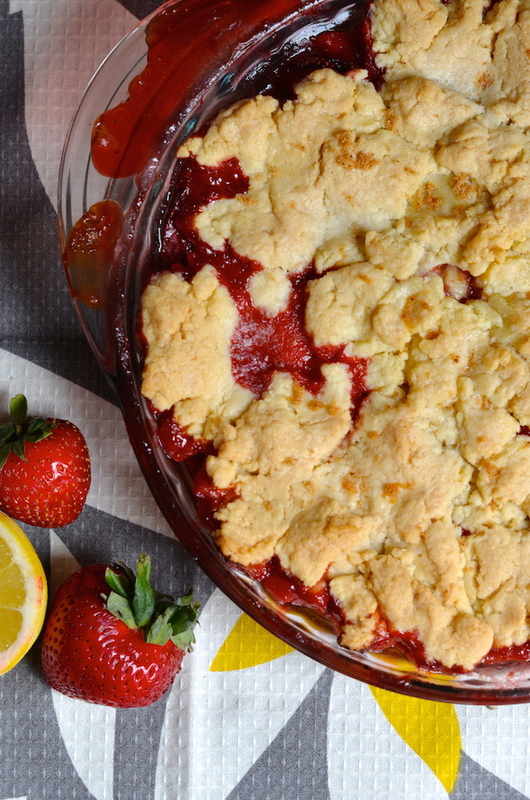 Place pie plate on a baking sheet (to hold spills—there will definitely be spills! 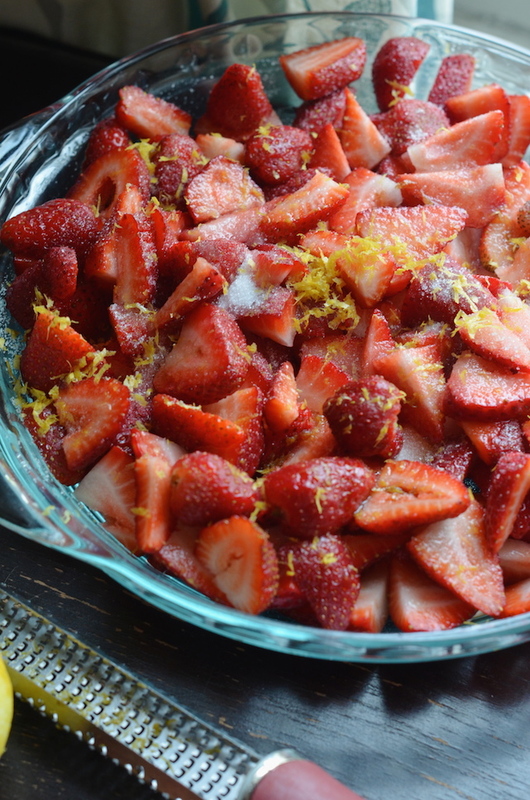 ), and bake 35-40 minutes, or until the crust is slightly golden and the berries are bubbling.